First things first. The Ulster Cup was a real breath of fresh air when it was first introduced in 1999. In the era before Twenty20, the format of 40 overs per side was shorter, sharper and it was refreshing to see the cream of NCU and North West clubs going to head on a regular basis. As the Celtic tiger roared at the start of the century and the Irish Cup became an effective graveyard for clubs north of the border, the Ulster Cup became even more relevant. It was just about the only means by which clubs from the NCU and North West could meet in the second half of the season. 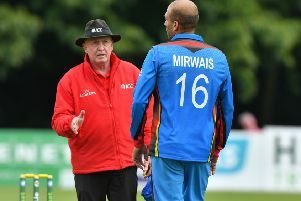 But after almost two decades, amid declining interest among players and spectators, it’s high time the cricket authorities pulled the plug on a tournament that felt increasingly like a burden in recent years. If any tournament should be the casualty of our increasingly bad summer weather it is the Ulster Cup. Two seasons ago the final itself between Bready and Waringstown was almost decided by a bowl-out before common sense prevailed, and the damp summer of 2016 has left the latter stages of the competition open to ridicule. First, in the quarter-finals, two of the ties were settled by bowl-out, cricket’s equivalent of the National Lottery. Without being disrespectful to Ardmore, the North West club were massive underdogs, first in their last eight tie against CIYMS, and then against Waringstown in the semi-finals. It was bad enough that Ardmore’s tie with CI went to a bowl-out (Waringstown won by the same method against Strabane), but for a semi-final of a premier cup competition to go to a bowl-out after a first washout in early July, when the final is not scheduled until the end of August, is a serious blow for the competitions’s credibility. The clubs, seemingly, weren’t offered any alternatives, but even if they had been, would there have been any appetite for either semi-finalist to have made the long journey down the A5? Had it been the Irish Cup, or either of the domestic senior cup competitions, you could have bet on both teams wanting another crack on the pitch. Instead, a bowl-out felt too convenient. Contrast the deeply unsatisfactory events in the Ulster Cup with the manner in which the NCU handled last weekend’s washout in the Lagan Valley Steels Twenty20 Cup finals day. The union have taken their fair share of stick over the years but last Saturday was a lesson in professional administration as the weather hit what is arguably now the flagship event in the NCU calendar. Faced by the miserable weather, the NCU has increasingly shown a willingness to compromise, to avoid the bowl-out. Thinking on their feet last Saturday morning, the NCU didn’t push the panic button and order bowl-outs in the two semi-finals when it quickly became apparent that play wouldn’t be possible before lunchtime. Nor did they suggest the lottery of a five-over ‘bash’ in poor conditions in an attempt to force through a final later in the day. Instead they quickly decided that playing both semi-finals and finals would be unrealistic but left the window open for some play if the rain relented early enough. In the end the damage was done at both The Lawn and Wallace Park, the semi-final venues, but both will now be rescheduled in the prime Friday evening slot, with the final given a separate date. Such innovation was probably not possible given the geography when NCU and North West clubs meet in the Ulster Cup. It is now much easier for Waringstown, for instance, to travel to the likes of North County or The Hills north of Dublin, than it is to make the arduous journey to the North West. So instead of persevering with the Ulster Cup, both unions would be best advised extending their respective Twenty20 competitions. In the current group structure of four clubs, NCU Premier League clubs may get just one home T20 Cup tie all summer. It’s time to double the number of group games to six. With the Ulster Cup gone and at least one free Saturday created, some of these could be ‘super Saturdays’, with three games taking place at one venue. One of my main gripes while watching cricket in the NCU is the references by some to the glory days of years gone by. To spend time with some boundary-onlookers you would think that cricket back in the 1980s was a wonderful spectacle and that today’s game doesn’t bear scrutiny. They are right to highlight the fall in crowds in the local game, but to blame it on a drop in standard is nonsense. Perhaps the strength in depth isn’t what it was, but would the likes of James Shannon, Greg Thompson or Ryan Haire not have prospered in the 1970s or 80s? Of course they would, just as Ivan Anderson and Simon Corlett would be mixing it with the best today. Society has changed and no longer do people want to spend between six and seven hours watching cricket. The second is the weather. It’s not just the imagination, the weather here has been getting wetter and wetter and as a player or spectator, cricket in the rain just isn’t fun. If anything cricket is much better to watch now. Think back to as recently as 1993 and the two-innings 60-over cup finals. North Down batted first against Waringstown and limped to 127 for seven in their first innings. Waringstown crawled to a scarcely believable 122 for six in reply. Imagine how many people would be watching if we returned to those days!